Home / Buhari / Change agender / News / Osinbajo / Presidency rolls out policy actions to revamp Economy assured Nigerians on change agender. Presidency rolls out policy actions to revamp Economy assured Nigerians on change agender. 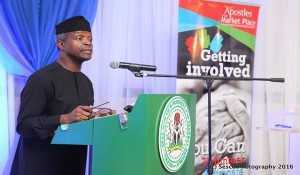 Speaking at the Nation's forum on the Economy held in Lagos, Vice President Osinbajo called on the Nigerians to remain patient assuring that the Buhari administration is firmly comitted to revamping the Nigeria Economic and fulfilling its promise. *Train and deploy 500,000 unemployed graduates as volunteer teachers who would be paid on the job while they seek jobs in their chosen careers. *Bursary awards for tertiary education students of Science, Technology, Engineering & Maths, STEM. Vice President Osinbajo also re-assured the nation on the Change Agenda in line with President Muhammadu Buhari's statement in his 2016 Budget Presentation speech, that "we remain committed to economic diversification through import substitution, and export promotion, in order to build a robust and resilient economy, as a lasting legacy for generations to come". He then underscored the necessity for continuous engagement with the Nigerian people, including stakeholders in the economy, stating that "we intend to start a quarterly meeting with members of the private sector and other economic stakeholders soon and thereby create a forum for engagement on an ongoing basis."